Authorities are hoping someone can help them identify a man who robbed a bank in central Iowa last week. The Story County Sheriff’s office released surveillance photos of the suspect today. Sheriff’s Sergeant Rodney Bunn says the photos were taken inside the South Story Bank and Trust in Slater, just before noon last Friday. 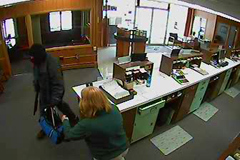 The bandit is shown wearing a black mask, black clothing and carrying a blue duffel bag and what appears to be a sawed-off shotgun. No one was injured. Bunn says the suspect took an undisclosed amount of cash. He also demanded and received the keys to a car owned by a bank employee. That car was found abandoned in a nearby cemetery. Bunn says a white Honda four-door car was seen the area of the bank at the time of the robbery. Story County robbery photo 2. Anyone with information about the case is asked to contact the Story County Sheriff’s office at 515-382-7476.